The reality is that most of us sit too much, either driving in a car or at our desks. Sitting all day increases our risk for obesity and puts us at risk for back pain, poor posture, leg cramps, tense muscles and sheer boredom. Here are 6 exercises you can easily do at work. Sit tall and pretend that you have a string coming out from the top of your head that is pulling your spine upwards. Now you’re ready to do some exercises and stretches. Tuck your chin in slightly and gently slide your head towards the back of your spine so that it is on top of your cervical spine. It’ll feel like you’re pushing the back of your head into an imaginary headrest. Otherwise known as making a “double chin”. Hold for a few seconds and repeat 5-10 times. Relax your shoulders. Let those tight upper back and shoulder muscles completely relax – your shoulder blades will slide down your back slightly. From here, tilt your head and neck to one direction and feel the stretch on the opposite side. Stay here, or you can also look down to your knee for an additional neck stretch. Let gravity do the work first then you can add a gentle hand to further stretch those areas. After stretching your neck and shoulders, try rolling your shoulders forwards and backwards to loosen them up. 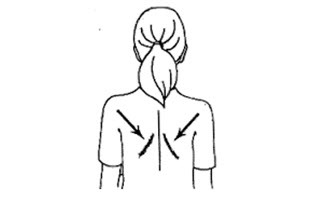 Then bring the bottoms of your shoulder blades down your back and slightly towards midline. The tops of your shoulder stay relaxed. Hold for several seconds. It can be one that you buy and can pump up, or it can be a small pillow or rolled up towel. 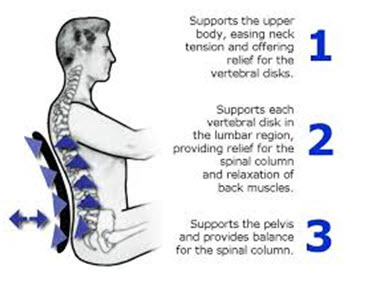 Tuck it in right around your sacrum. Gently tilt your pelvis forwards and you’ll feel like you’re still taller in your seat. Find a doorway or a hallway where you can rest your forearm on the wall and walk half a step forward. You should feel the front of your chest, your pectoralis muscles, stretching. Experiment with different angles for a full stretch. Dr. Sophie Tran is a Chiropractor at Alliance Wellness practicing functional movement-based assessments, chiropractic care, Active Release Technique®, athletic taping, rehabilitation and exercise. Our practitioners will recommend a treatment plan to help you achieve your health goals.